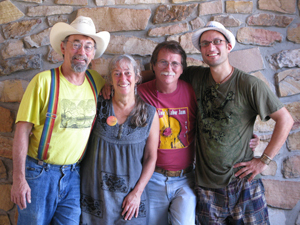 The Avant Gardeners are fiddler and vocalist Laura Light, George Paul on piano and accordion, Dave Wiesler on keyboards, guitar and mandolin and Jubal Creech on percussion, with Al White from Berea, KY and Dave Bartley from Portland often filling in for stay at home dad, Dave Wiesler. 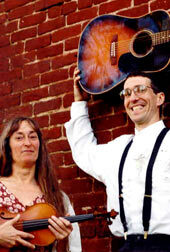 The tunes are eclectic, original and rootsy - American hybrid variety. The deep grooves of the bands mixture of traditional and composed tunes have contributed to the ecstasy of dancers at countless dances and concerts from coast to coast. Their range of performing styles from traditional swing, Celtic and old time and their facile improvisation on fiddle, piano, accordion, guitar, mandolin, , percussion, banjo, will leave you wanting more. Goats in the Garden - The newest Avant Gardener cd is a classic Gardener mix of original melodies, rockin' dance music, swing and soulful ballads and waltzes. The clan gathered last summer and put down some earthy tracks right at home on the Decca farm (see the Bill Dudley video!). Dave Wiesler, Dan Sebring, Jubal Creech joined Laura and George at home for what amounted to a mini festival, and this cd was born. Special guests Ralph Gordon on bass, Andrew Marcus on accordion and Jeff Romano on guitar added some spice on a few tunes, and the Gardeners are proud to present their newest harvest, Goats in the Garden. Avant Gardener CDs: Tulip Bandits, with George, Laura, Dave, Roger Gold, Stuart Kinney, Scottie Williams and Bobby Read was just released in the spring of 2006. This recording is mostly original compositions and mostly the dance medleys we've been asked to record! thanks to all of you who kept writing to urge us to get it done! In addition, there is a little Ray Charles, and a couple of sweet ballads of Laura's. Done live in the studio, the recording captures some of that good contra mojo. Original Gardeners, Laura, Dave, and Dan Sebring with bassist Ralph Gordon, percussionist Paddy League, and vocalist Jo Taylor, released STRONGER THAN DIRT, in 2003 - all original songs, hot swing, and jigs and reels. Featuring the writing of all three gardeners, connoisseurs of homegrown hybrid folk music will definitely want to check out this fresh batch of songs and tunes. This group is a non-standard variety, mixing years of misspent youth rock and rolling with endless jams at fiddle festivals, swinging jazz with tinges of klezmer and Irish reels, classical strains amongst folk melodies. "People are going to love this CD!" - Grammy award winning mastering engineer Charlie Pilzer, Airshow. for CD and booking information. Laura Light of Charlottesville, Virginia and George Paul of Eagle River, Alaska - how did this happen? It seems Laura was asked to play some engagements in Alaska, but only received ONE airline ticket! Not to worry, said the organizers, we have a great pianist here for you here. And they did! The music flowed freely and beautifully together, and the musical partnership evolved into personal partnership. 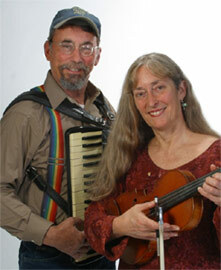 Both prolific composers, George and Laura perform their own music and their own original blend of traditional dance music around the country and beyond, both as a duo and with the Avant Gardeners. CD Release: The Katchemak Bay Waltz, Love in Three Quarter Time, a fine collection of original waltzes is now available at this website, soon to be available on the internet via Efolkmusic.org. These waltzes relflect the eclectic backgrounds and tastes of Laura and George - jazz, classical, country, and traditional flavors. The CD features Laura on fiddle and vocals, George on keyboards and accordion, Dan Sebring, Bill Dudley and Roger Gold on guitar, Ralph Gordon on bass and cello, Paul Brier on trumpet, and Mary Gordon Hall on vocals.